​ "In 1967, exactly a century after the discoveries made by Charles Warren, the famous British Archaeologist Kathleen Kenyon opened a small excavation area, which she termed SII, at the foot of the northeastern wall of the Byzantine guard tower that in turn was built directly upon the Extra Tower. ...Although Kenyon did not make a direct connection between Warren's findings and her own, which had exposed that part of the Extra Tower not reached by Warren, her excavations nevertheless succeeded in determining the full 11.5-m-length of the Extra Tower and the 17.2-m-width of the Large Tower. Kenyon dated the pottery discovered in the earth fill found at the base of the Extra Tower to, at the latest, 8th century BCE, thus attributing the same date to the tower and to the segment of the city wall which she had uncovered as well. This dating, however, is problematic, since pottery from exterior fills could only have accumulated there after the structure in question had been built. Therefore, Kenyon's dating gives only what archaeologists call a terminus ante quem, the latest possible date of construction. Because of this, the structure could have also been built sometime before the 8th century. ​ In Kenyon's view, the impressive construction of the Extra Tower recalled a Phoenician style that she had encountered in her excavation of the acropolis of Samaria, which served as the capital of the Kingdom of Israel during the 9th century BCE. Because of this, Kenyon believed that the stones of the tower had been brought to the site in secondary use from a nearby structure built by King Solomon. It is unclear, however, why this wall would have had to be made of reused stones, and the far simpler conclusion is that it was built of stones intended for this purpose alone. ​ ...Although still far from complete, the results of Kenyon's excavations in Area H and Square SII led her to conclude that the remains of the city wall discovered in both areas should be dated perhaps not to King Solomon himself, but "they were not far removed from this period" (Palestine Exploration Quarterly 100 (1968): 104). 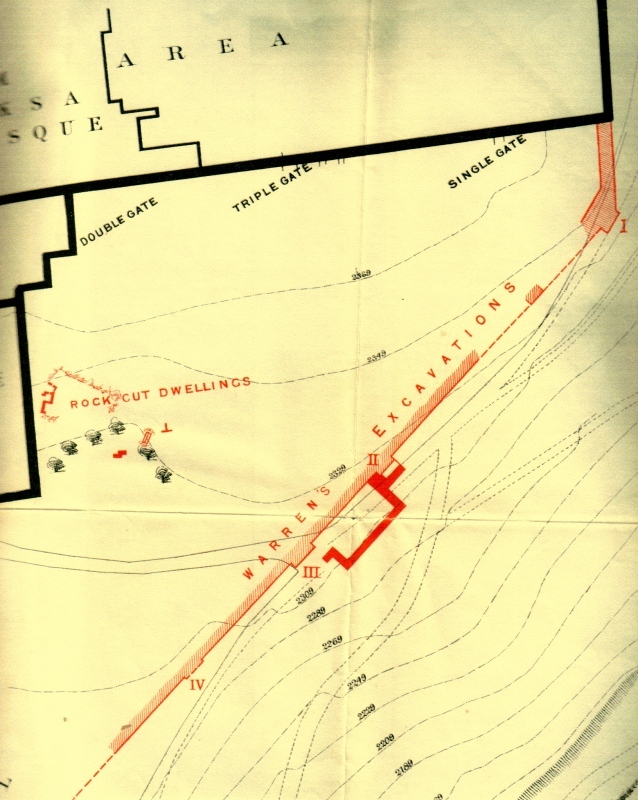 Though her contributions to the understanding of the city's growth from as early as the 10th century are particularly noteworthy, her dating begs serious questions: if the fortification line was in fact built not long after King Solomon, then where was the city wall that he did build, as described in the Bible? What could be the reason for building another city wall so soon after Solomon had built his wall to encompass the newly settled areas of Jerusalem?" (Eilat Mazar, Discovering the Solomonic Wall in Jerusalem, 2011, pp.35-38). ​ Mazar is correct in questioning Kenyon's theory that the Extra Tower was constructed of stones brought in secondary use from a nearby structure built by King Solomon, especially in light of its header and stretcher construction which is also characteristic of the Phoenician builders. "The massive wall where first encountered is about 50 feet in front of the Golden Gate." 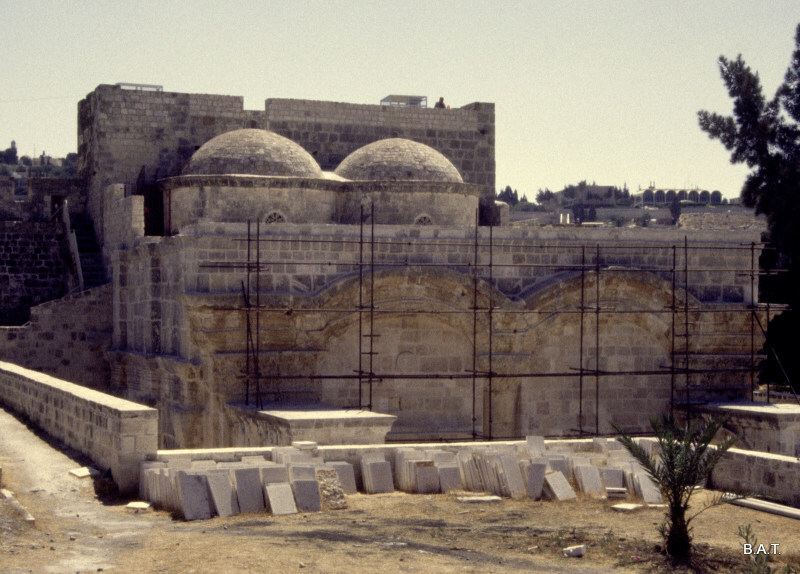 While visiting the Temple Mount in 1984, I took a picture of the back side of the East Gate of the Temple Mount (see below). While examining the picture, my brother, Bill, noticed the scaffolding that had been set up during reconstruction of the gate and he suggested that we compare the standard measurements of scaffolding with the width of the current guardhouse. 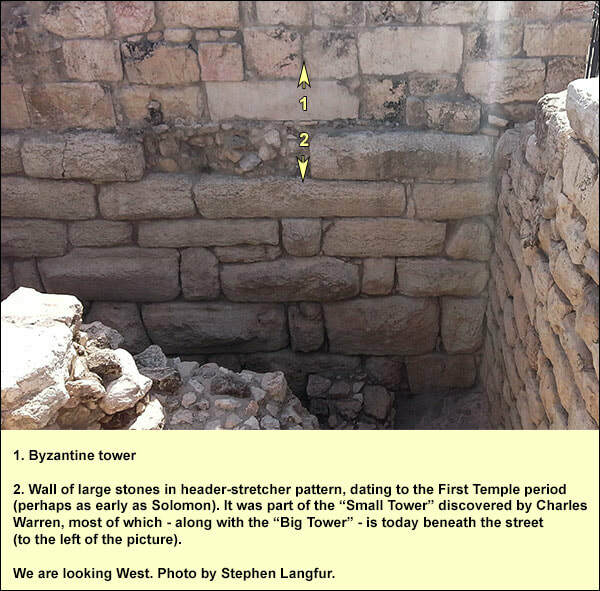 This allowed us to get an approximate measurement of the width of the existing structure - 48 feet - the same width as Solomon’s six-chambered gate in Megiddo. ​ To prevent the enemy from conducting a direct assault, Solomon's builders constructed a wall in front of the East Gate, similar to the one at Megiddo. The wall formed a courtyard in front of the gate and changed the direction of entrance ninety degrees. Just to the south, the Ophel Gate (Horse Gate) also has a wall in front of it (attached to the tower and constructed with Phonecian ashlars). 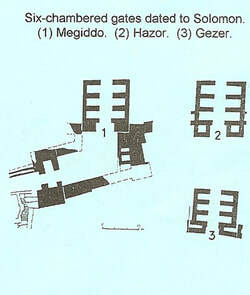 Because of the topography, the courtyards varied in shape; however, the area of each is about the same. The Ophel Gate and East Gate courtyard walls were both discovered in 1867 by the eminent British archaeologist, Captain Charles Warren. The ashlars (laid in the header and stretcher style) are Phoenician in character and in each case, date to the time of King Solomon. ​ In light of I Kings 9:15, and the archaeological discoveries to the east and south of the Temple Mount, I believe that there is enough evidence to conclude that remnants of a six-chambered gate, dating to the time of Solomon, currently exist beneath Jerusalem's magnificent Golden Gate. This guardhouse may be built directly over what remains of the original Eastern Gate of the First Temple Period. This magnificent courtyard wall, found by Warren, had a tower connected to it's northern end. 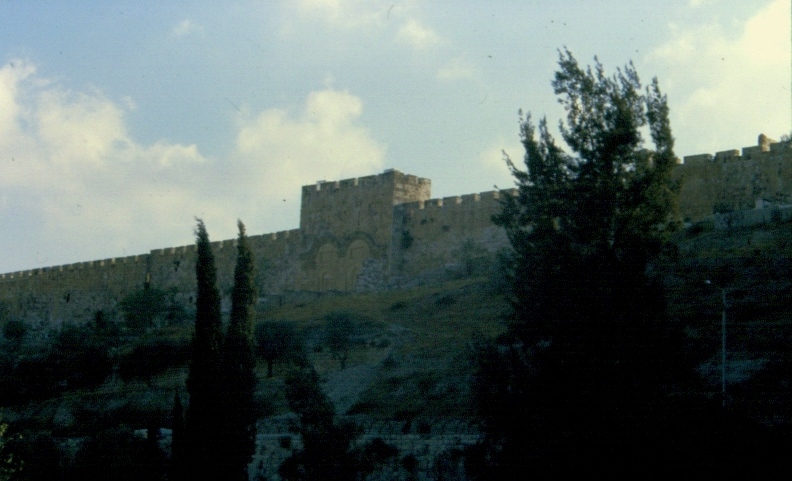 The tower incorporated Phoenician ashlars and a "header and stretcher" construction style which has been assigned to the time of King Solomon. The associated four-chambered gate and city wall here have been shown to be older than this tower and, therefore, may have been constructed by Solomon's father, David... but that's another study!